God, the creator, gives every human being on the planet opportunities to fulfill his/her destiny. Everyman is, in embryo, a possible hero. All that is needed is the opportunity and time for development. 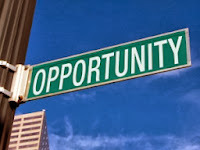 Opportunity is a favourable time, chance, occasion or set of circumstances for doing something. It is taking full advantage of a situation or circumstance to achieve a goal. One other interesting definition of opportunity is this – It is the preference of what can be done to what should be done. The difference between a success and a failure, between the poor and the rich is how they manage opportunities that come their way. It is called OPM – Opportunity Management Skills. What was perceived as a problem to the poor was seen as an opportunity by the rich. The opportunity that a successful man capitalized on, was seen as “work” by the man who failed. In this session, permit me to share with you how you can improve your skills in managing opportunities. There is something interesting about opportunities. They are everywhere! They are all around you. Watch out consciously for them. Opportunities mostly come disguised as problems. Infact, every problem presents an opportunity for a solution. In other words, there are actually more opportunities than are problems! The problem of electricity was Faraday’s opportunity. The problem of nuclear energy was Albert Einstein’s opportunity. The list is endless. Recognizing opportunities is sure the beginning of making the best of them. Most times, opportunities wear an overall labeled “WORK”. Don’t run away from them. They are stepping stones to greater heights. All through his life, Joseph was always watching out for opportunities to interpret dreams – at home, in the prison, until he interpreted the dream of a King, and then became a prime minister. Look for problems around you and see them as opportunities for greatness. Success is not just how many opportunities that comes your way. It is dependent on the number of opportunities well utilized. Explore every opportunity that comes your way. Don’t just wish for opportunities, work it! When you see an opportunity, take it. Go for it. I remember several years ago when an opportunity presented itself to me. I was relatively unknown in my fellowship back in University then. A friend invited me to his birthday and I was asked to share a few words for a couple of minutes. Since many executive members of the fellowship were in attendance, I felt a little worried and concerned. Thanks to God I took this opportunity, for it was the beginning of several cycles of opportunities that brought the best out of me in that same University. Don’t just watch out for opportunities, but go for them when they show up. A lot of times, people despise small things. They disrespect certain opportunities to their own perils. Never underestimate an opportunity, no matter how small it seems. Give every opportunity your best shot! I have discovered that one opportunity well utilized, will give birth to at least one other. Opportunities are like chain reactions linked to each other. If you disrespect a seemingly small opportunity, you may be eating up your destiny for lunch. Imagine that Joseph didn’t respect the opportunity that came his way to interpret the dream of the Butler and the Baker in prison. Imagine that he despised it and said to himself “my anointing is greater than interpreting dreams for prisoners. These guys are not at my level”. He would most likely have been forgotten in prison. May I encourage you to please respect every opportunity that God brings your way? The importance of this cannot be overemphasized. The reason why many people remain where they are is that when opportunities appear, they are not prepared for it. Listen. If you are trying to be ready when you are supposed to be ready, you are already late! It is better to be prepared and not have any opportunity, than to have an opportunity and not be prepared. Men of purpose always prepare for opportunities. They cannot afford to waste time, because to them, even time is an opportunity. How prepared are you for your opportunity? Joseph was well prepared for his opportunities. When Pharaoh sent for him, he shaved, changed his clothes, and appeared before him the way a man should appear before a King. I perceive in my Spirit that he already chose a cloth for the occasion. He was so prepared. Everyday, opportunities for greatness are passing your way. How prepared are you? There is a principle I call the P6 theorem. Proper Prayerful Preparation Prevents Poor Performance. When you fail to prepare for your opportunities, then be prepared to fail! It’s that simple. I like the way a wise man puts it. He said “the secret of success is to be ready for opportunities when they come”. If you use these principles, I am sure you will improve your Opportunity Management Skill and will be a better individual. You are a miracle. Go and happen!